No More Heroes was a cult classic on the Nintendo Wii. Released in 2008 (or 2007 for Japan), the game featured incredible humour, clever writing and crazy action, making it one of the more unique third party titles to be released on the platform at the time. It was successful enough that it was ported to the PS3 and Xbox 360 systems, with a sequel No More Heroes: Desperate Struggle also releasing on the Wii in 2010. The franchise has remained dormant ever since, but thankfully creator Goichi Suda was inspired to revive the series on Nintendo Switch. 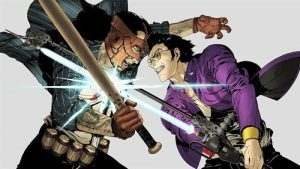 Travis Strikes Again: No More Heroes is a worthy follow-up for fans, though like its predecessors design flaws hold it back from being a truly great title. Set seven years after the events of Desperate Struggle, Travis is now living in isolation in a caravan in the middle of nowhere and spends his days playing videogames. One night a former baseball player turned assassin, Badman, breaks into Travis’ caravan in hopes of killing him in an act of revenge for the death of his daughter. His daughter, Bad Girl, was assassinated by Travis in the first game. While Travis and Badman fight they accidentally activate the mysterious game console Death Drive Mark II, which transports them into a videogame. It is said whoever wins all the console’s games will be granted a wish, so Travis and Badman compete to be the first one to defeat all the games’ final bosses. There are actually a couple of different stories being told here. Firstly, you’ve got the core story of Travis and Badman completing all the Death Drive Mark II games. As you progress you will receive details of who developed the machine and for what purpose via in-game faxes (yep, faxes…). The Death Drive games have mini stories as well to help set the scenario that Travis and Bradman find themselves in. Some examples include locating a serial killer, solving a murder mystery in a mansion and competing against a car racing legend. The game stories are told through NPC conversations and Archives which are set up as magazine reviews that you can zoom in on and read. Finally, there’s also a visual novel adventure dubbed Travis Strikes Back. This shows how Travis acquires the Death Balls – the name given for the Death Drive’s games. Travis Strikes Again: No More Heroes constantly breaks the fourth wall with much hilarity, often referencing the real-life player and making jokes at the game’s own expense. 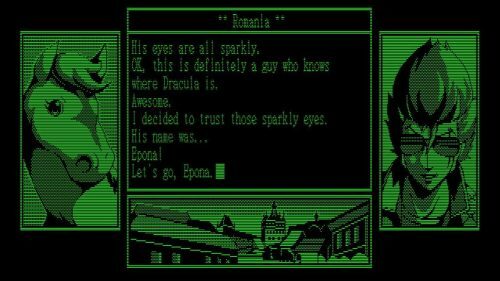 There are also plenty of nods to other franchises, such as a certain horse named Epona which is an obvious reference to Nintendo’s own The Legend of Zelda. There are plenty of laughs to be had and in classic No More Heroes style it is absolutely refreshing for a game to not take itself so seriously. Like previous games in the series, Travis Strikes Again is primarily a hack-n-slash title where you fight your way through hordes of enemies until you reach the end boss fight. Players have basic light and strong attacks, the ability to jump and can also perform a dodge maneuver. New to the series are Skill Chips which grant players special abilities including a scatter shot that damages and stuns enemies, the ability to fire an orbital laser and being able to heal yourself. Each ability has a cool down period after use but these are generally short. You can equip up to four Skill Chips at once and there are plenty more to find that are hidden throughout levels, so there’s encouragement to experiment and discover which combinations suit your play style. Most levels are played from an isometric perspective, though the camera angle will change depending on the Death Drive game you’re playing. For example, one of the games will see the camera change so that it resembles a sidescrolling platformer. Another game has sections where the camera pans out to provide a birds eye view of the stage so that you can flick switches to reveal the correct pathway to an objective. The games also deviate from the standard hack-n-slash formula, providing short bursts of racing, platforming and puzzle solving genres, as well as one particular moment where you play a knock off of Asteroids. These are welcome distractions as the general gameplay does otherwise get repetitive during extended play sessions. You primarily progress through a stage by moving from room to room fighting any and all enemies that spawn. Once you’ve cleared a room you progress to the next; rinse and repeat. 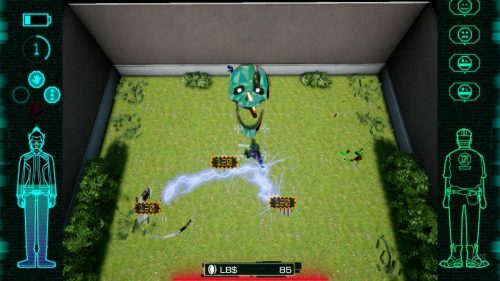 Enemies are varied – some will block your attacks, some can drill underground and attack from below, others will disable your special abilities and some have more health than others. Due to the lack of combo moves and overall tactics however, at times it feels like you’re mindlessly mashing away at the attack buttons which becomes uninspiring. But let’s not kid ourselves; the highlight of No More Heroes has always been the boss fights, with each encounter being unique and requiring a different strategy to overcome. It boils down to analysing the boss’s attack patterns and responding appropriately, though the bosses also have multiple phases which will force you to keep adapting. The bosses are never dull and they’re a genuine reward for getting to the end of a level. This is the first No More Heroes title which features local multiplayer. You can play the game completely solo or team up with a mate by assuming the roles of both Travis and Badman. It’s definitely a better overall experience playing with someone else as you can double team enemies and make short work of bosses. As an added bonus there’s support for using single Joycons, so you’ll have everything you need from the get go. Instead of displaying a generic health meter in the corner of the screen the developers have opted to display a full body avatar of Travis and Badman on the sides to indicate their health. This takes up a fair amount of space on the screen, at times making it feel too cluttered and blocking your view of the surrounding areas. Visually the game is a bit of a let down. The presentation is neat and features cel-shaded graphics, but at the same time you never get a wow factor apart from the cinematics. Environments are basic and character models aren’t overly detailed, plus due to the isometric view you’re zoomed out and can’t make out faces too well. When playing in handheld mode at times the camera is panned out so far that it’s difficult to make out what’s happening on screen; not the best situation for an action title. As with previous entries there is a great mix of techno and rock tunes to enjoy. 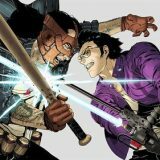 The soundtrack doesn’t quite standout the same way as its predecessors, but Travis Strikes Again: No More Heroes still evokes the feeling of the franchise. Disappointingly the game doesn’t feature full voice acting this time around. 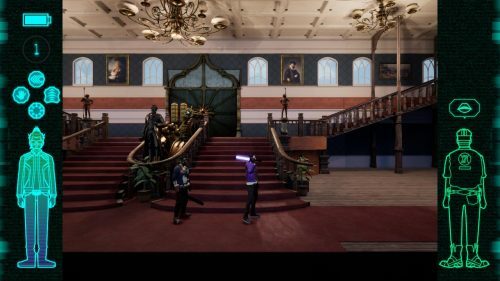 Travis Strikes Again: No More Heroes will immediately appeal to fans of the franchise and anyone looking for a quirky game. 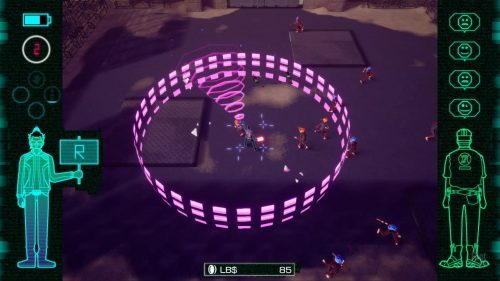 There’s a lot of humour and style injected into the title and the mix of gaming genres is interesting and helps break up the otherwise repetitive hack-n-slash gameplay. For all its strengths though Travis Strikes Again falls a bit short in being a stand out title, let down by uninspiring combat and a few annoying design choices.